- The ’Paradigm Shift’ scenario, which included the developments that were perceived as desirable by the majority of the stakeholders. - The ’Paradigm Shift +’ scenario, which additionally allowed for the deployment of several technological mitigation options, that stakeholders judged as undesirable or discussed controversially. This included liquid biofuels as well as carbon capture and storage (CCS). 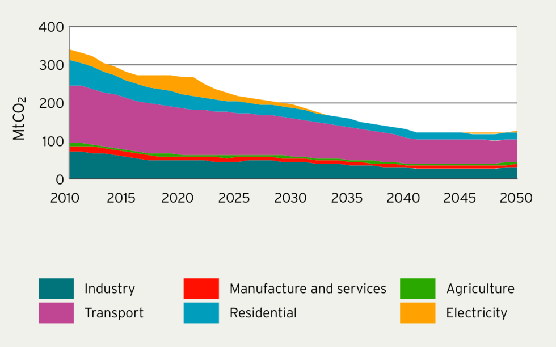 Graph: Sectoral emissions of the three scenarios with 85% reduction requirement. In particular the differences between the scenarios are remarkable for the electricity and transport sectors. The model results indicate that the ’Continuation’ scenario leads to a carbon lock-in, where the majority of the cumulative CO2 emissions by 2050 are used for road transport and coal-power plants. This lock-in and the CO2 reduction requirements combined to slow down economic growth with a cumulative GDP loss of 3.5% until 2050 (compared to the baseline with about -40% reduction in 2050), leading to undesired effects for society. One such undesired effect is that personal transport is forced to decrease from 13000 person-km (p-km) per year today to 9000 p-km by 2050. This renders ambitious domestic mitigation extremely challenging. Moving to the ’Paradigm Shift’ scenario, where the carbon lock-in is resolved, while energy efficiency and renewable energy growth rates increase, the cumulative GDP losses are reduced to 1.4%. As an example, in this scenario the personal, motorised transport is reduced from 13,000 p-km today to 11,000 p-km by 2050, and additionally it is assumed that the gap is filled by non-motorized transport, e.g. bicycling or walking. In the ’Paradigm Shift + ’ scenario, the mitigation costs decrease further to 0.8% cumulative GDP losses, a minor decrease from the ’Paradigm Shift’. The small economic difference between these two scenarios suggests that the choice of the contested technologies can be left to further analysis of their viability. Graph: 1.2 Mitigation costs in cumulative GDP losses for the three scenarios. 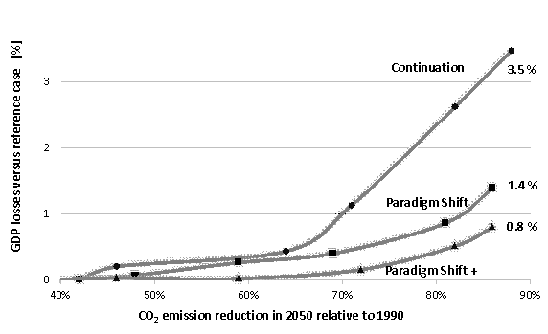 The curves show the benefit of overcoming the carbon lock-in in coal-based power production and fossil-fuel based freight transport, once the CO2 emission reduction requirements are higher than 70% reduction in 2050 relative to 1990. In conclusion, the scenario based on the development that stakeholders find likely will lead to carbon lock-ins that makes the transition to a low-carbon society expensive, and also politically and socially difficult. Choosing a scenario that is perceived as desirable but not likely by most stakeholders, however, can achieve the transition at lower economic costs. Further analysis would be useful investigating together with stakeholders what would be necessary developments to move evaluations from desirable to realistic. The Imaclim-R France model was used to develop a low-carbon scenario for France, where inputs were defined by French stakeholders during stakeholder meetings. The modelling team included measures that were supported by at least a majority of stakeholders. This "Acceptable Mtigation Scenario" results in a reduction of energy related CO2 emissions of 68% over the 1990-2050 period. Compared with the reference scenario, the mitigation scenario has a number of positive effects for society over the period 2010-2050 including higher GDP, a lower unemployment rate, lower energy imports and lower households’ energy expenditures, even including the costs of energy-renovations. The positive effects for GDP only start in 2015 and household budgets only become lower from around 2025. Until then there is an “investment period” with up to 0.3% lower GDP in one year. Unfortunately, the CO2 reductions are below the objective of a “Factor Four” - 75% reduction of emissions over the 1990-2050 period. Because the reductions did not meet the reduction objective, the modelling team designed an “Additional Measures Scenario” with renovation obligations for buildings and with an energy/CO2 tax instead of a CO2 tax only. Both measures were not supported by a majority of stakeholders. This alternative scenario leads to 73% emission reductions instead of 68%, over the 1990-2050 period. Also the impact of a different use of the carbon tax revenues was investigated with sensitivity analyses. 1) Residential sector, where stakeholders agreed to a series of measures including tax credits and zero-interest loans for energy renovations, a carbon tax. These measures lead to the renovation of most buildings up to a level “C” (annual heat consumption 91-150 kWh), while new buildings will have heat consumption below 50 kWh/year. 2) Transport sector, where stakeholders agreed to a series of measures including eco-taxes, urban planning, promotion of tele-working, a rail investment program, together leading to a smaller shift from road to rail, but a large-scale introduction of hybrid-electric vehicles. Hybrid-electric vehicles represent 50% of the car fleet in 2040 with most of the rest being fuel-driven cars with consumption better than 3L/100 km. 3) Electricity sector, where stakeholders agreed to ban shale gas, and keep nuclear and Carbon Capture Storage (CCS). Agreed policy measures included progressive tariffs (higher tariffs above a given consumption level), feed-in tariffs, and taxes. This package of measures leads to a gradual increase in renewable electricity, gradual decrease in nuclear power production, and some fossil fuel use to meet the remaining demand. Electricity exports were drastically reduced compared to the today’s situation. Tax credits: The purchase of refurbishment elements is eligible to income tax credits. Increased rates and an extended eligibility base are modeled from 2009 until 2050 through a uniform tax rebate of 30% of the investment. Zero-interest loans for retrofitting actions: 0% interest rates apply for retrofit packages with a maximum amount at 30,000€ per dwelling. The credit duration period is about 10 -15 years. Thermal regulation for new buildings:From 2012 maximum primary energy consumption level: 50 kWh/m²/year of primary energy. After 2020: new buildings have to be net producers of energy. Biogas: The biogas penetrates gradually between 2012 and 2050. Its share reaches 17% in the gas in 2050. Urbanplanning: Economic incentives and regulations slow down urban sprawl until 2030. After 2030 urban density increases again. Vehicles occupationrate: increase of the cars occupation rate for urban transport from 1.25 to 1.5. Kerosene tax: A tax on kerosene consumption for air transport is introduced in 2012. It represents 400€/toe. Heavy truck environmental tax: An eco-tax on the liquid fuel consumption of heavy trucks is introduced in 2012. It is calibrated to bring in 1.2 billion € in 2012. Rail investment program: Investments in road infrastructures are limited to maintenance of infrastructures. Investments are shifted from road to rail for 20 years. All collective transports investments are deducted to the road infrastructuresinvestments. Bonus-malus: is extended until 2050. A positive annual financial balance for the government budget or at least close to 0 is obtained. Logistics: Annual decoupling of freight transport needs of 1% for all sectors. 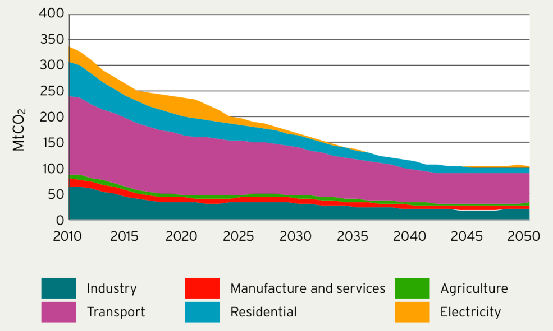 Infrastructures: The modal share of rail transport in freight reaches only 20% in 2030 (exogenous assumption). Feed-in tariffs: Feed-in tariffs for renewable energies are economic incentives to facilitate the market penetration of these technologies to accelerate the learning effect. Feed-in tariffs are normally decreasing over time and end when the technologies achieve price competitiveness with other technologies. Demand side management: Implicit measures (interruptible contracts, smart metering) are used to flatten the load demand curve. Interdiction of electric heating: Electric heating is not globally banned but the implementation of the thermal regulation up from 2012 is defacto excluding electric heating (exception heat pumps). Expectations: The electricity sector is assumed to receive clear carbon tax signals and expects the exact value of the carbon tax for the whole period. Existing nuclear plants lifetime extensions: 40 GW out of 63 GW have their lifetime extended for 0.7 billion €/GW. Carbon tax: 32€/tCO2 in 2012, 56€/tCO2 in 2020, 100€/tCO2 in 2030, to 200€/tCO2 in 2040 and to 300€/tCO2 in 2050. Progressive tariff: For all households, any consumption above 60 kWh/m2 is more expensive: 5% after 2014 and of 10% after 2030. Carbontax recycling: The carbon tax income is recycled in a lump sum towards households (each person receives an equal share of the total perceived amount). There are substantial differences between the German and the French scenarios. This is not only caused by the difference between the two countries and the different decisions of the stakeholders involved. Also the different models used in the project and the different approaches for stakeholder involvement are important for the differences. Because of the variations of several factors that influenced the scenarios, a comparison of the French and the German scenario cannot be used to draw conclusions on specific differences between the results. Instead the following comparison explains major reasons for some of the observed differences between the scenarios. The German scenarios consist of a set of three scenarios that are results of stakeholder preferences and judgements, while the French scenarios consists of a central scenario (acceptable mitigation scenario), integrating stakeholder opinions, an additional measures scenario that does not have support of a majority of the consulted stakeholders, and sensitivity analyses for the scenarios. The French “Mitigation Scenario” has a positive influence on GDP compared with the reference scenario with limited emission reductions, while all German scenarios show GDP losses against a counterfactual baseline case with only limited reduction efforts (see Graph). This difference has its reason in the difference of the modelling tools: the REMIND-D’s baseline is inter-temporally optimised, so it is not possible to generate another scenario with lower costs, while this is possible for the Imaclim-R France. Another important difference between the French and the German scenarios is the continued use of nuclear power in the French scenarios, though on a lower level than today. The French stakeholder-majority wished the maintenance of nuclear power in the electricity mix. The French scenarios include an “Additional Measures Scenario” that reaches the “Factor Four” emission reduction objective with two additional measures, which were not consensual among stakeholders. This is similar to the German “Paradigm Shift+ Scenario" that reaches lower mitigation costs but includes technologies, e.g. CCS, that are not well accepted by the stakeholders. In conclusion, the different models produced different scenarios that are not comparable in details, e.g. it is not possible to compare the cost or benefit of the transition between scenarios made with REMIND-D and Imaclim-R France. But the similar approaches of stakeholder involvement showed the benefit of this approach by producing scenarios that are acceptable for a large number of stakeholders. Read more on the scenarios of the ENCI-LowCarb Project in the Reports including: “Acceptance and Economic Assessment of Low Carbon Scenarios. A participatory approach applied to France”, Ruben Bibas, Sandrine, Meike Fink et. al. March 2012; “Ambitious Mitigation Scenarios for Germany: A Participatory Approach”, Eva Schmid et. al, February 2012; and "REMIND-D: A Hybrid Energy-Economy Model of Germany", Eva Schmid et. al., January 2012. Download from: Reports, Posters, Fact Sheets or from Reports - www.enci-lowcarb.eu .